Hi! It’s Mother’s Day tomorrow so it’s absolutely the right time to be writing about kids and green smoothies. I’ve been wanting to write this for a while and a recent trip to Sydney to see VIctoria Boutenko and all the fun green smoothie making with my niece and nephew has reinspired me to do this. I love how Robyn Openshaw’s The Green Smoothie Girl main mission in life is to inspire and help mothers to get their children to eat healthy food. As a mother of 4 she believes we are the most important person in our children’s lives/health because mothers hold the power of the nutritional dollar as they are mostly doing the food shopping and cooking and have the most influence over what their kids are eating. Jamie Oliver’s Food Revolution LA started last night here and the majority of people who turned up wanting change in their kid’s school lunches were mothers. 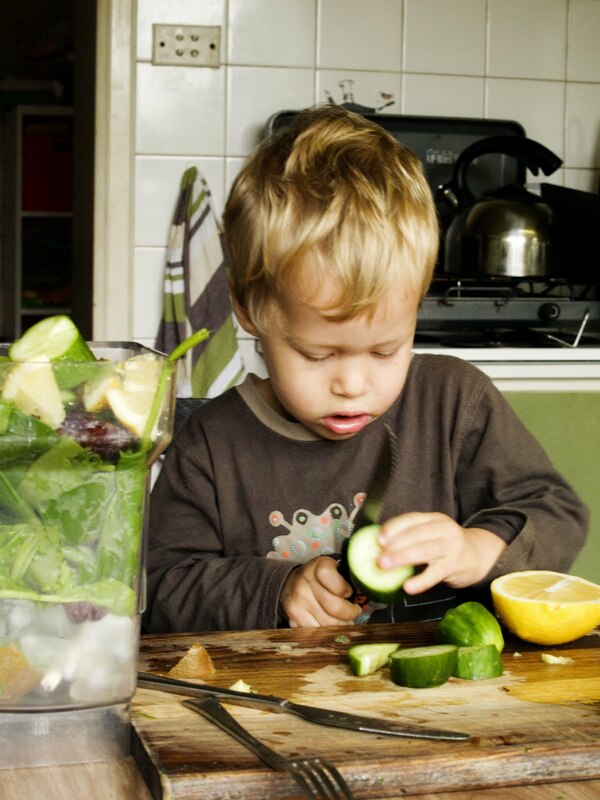 We have the power to change the world just through food and through our children- ultimately bringing up super healthy children who become healthy adults who in turn will pass this power onto their own children! 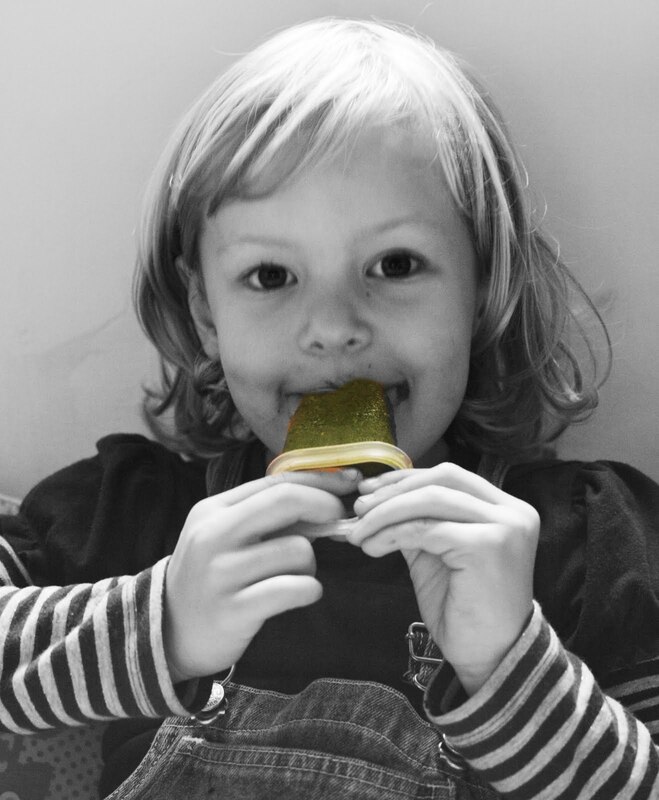 So the number one challenge for parents everywhere is to get their children to eat vegetables…especially leafy greens…the dreaded greens like spinach are among the most hated vege by children everywhere. “Eat your greens!” – which ironically are the most healthy and nutritious food on the planet. Of course the BEST way to do this is green smoothies! Transform those hated greens into a delicious fun super healthy drink by blending with fruit and sit back and watch your kids drink them up! I really wish I had known about this when mine were younger. They are now green smoothie fans which is great. Here are some tips to help if you have young kids or relatives or know any parents that might be interested and are doing the daily struggle with their kids and food. 1.be the best role model you can for healthy eating and let your kids see you drinking your greenie and lovin it! Try and live by example. 2. get them involved in the making, chopping, choosing of ingredients and what to buy when shopping. Get excited about the greens in the supermarket. Ask them to choose their favourite fruit. Ask them as you are making to taste test it and what they think it needs. More lemon? More banana? 3. for really reluctant newbies or anyone that doesn’t like trying anything new don’t let them see you putting any greens in! 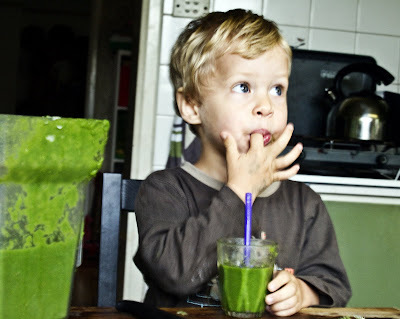 Even some adults go urrggghhh when they see the greens going in the blender or know there’s spinach in there- until they taste it! Often adults who were brought up eating fresh fruit and veges from a young age are the ones who don’t develop sugar cravings when they are in their teens and older. 5. give your green or purple smoothie a name – Monster Hulk smoothie, Big Green Monster, Purple Tongued Lizard Dragon Juice, Octonaut Super Slime or whoever their fave superhero is. 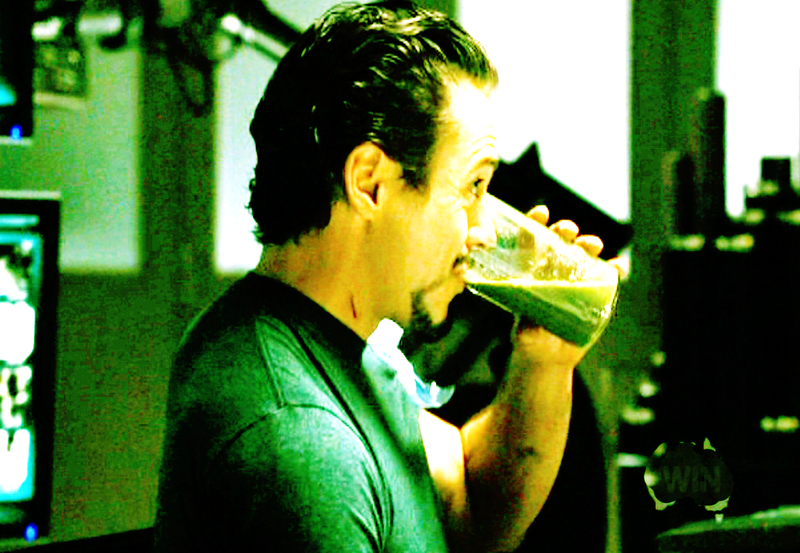 Don’t forget Shrek and the Incredible Hulk are green….well it is the age of marketing food with toys and movies ….even Iron Man downs a green smoothie in one of his movies! Incredibly the sale of onions rose in 2010 because kids wanted to eat them like Shrek did and were actually asking their parents to buy them. Imagine if Shrek was getting into green smoothies! FInd inspiration in unexpected places. 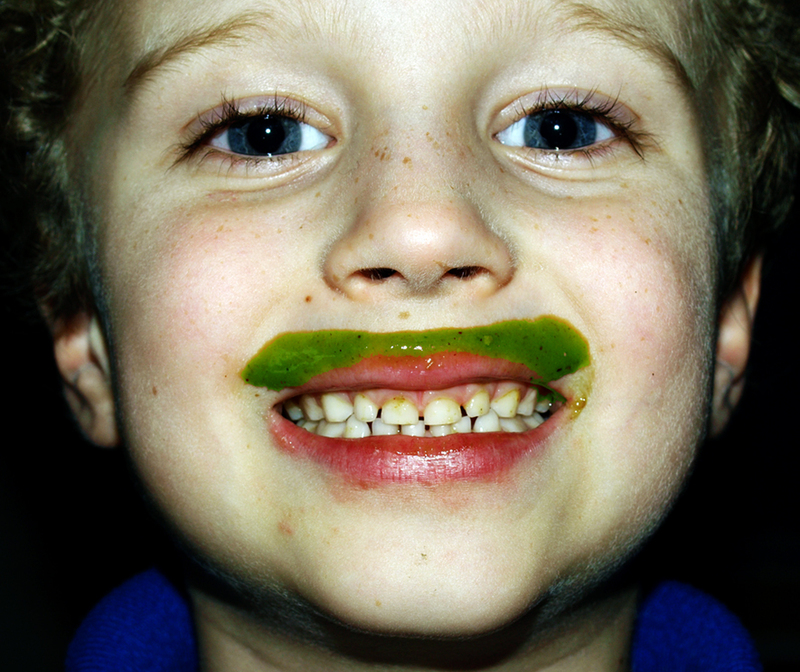 4.show them pics online of all the kids with green moustaches and take their green moustache photo. Celebrate healthy food! 6.add BLUEBERRIES! turn your green smoothie into a purple monster to hide the green. 8. Arm yourself with info. Here’s Robyn talking to her son about greens and giving hints about how to talk to your kids about food and nutrition and why they should be eating healthy and why green smoothies!!! 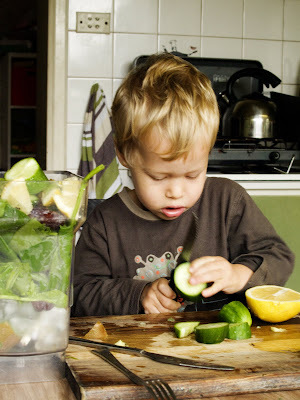 Green Smoothie Revolution by Victoria Boutenko has a section on kid’s recipes. 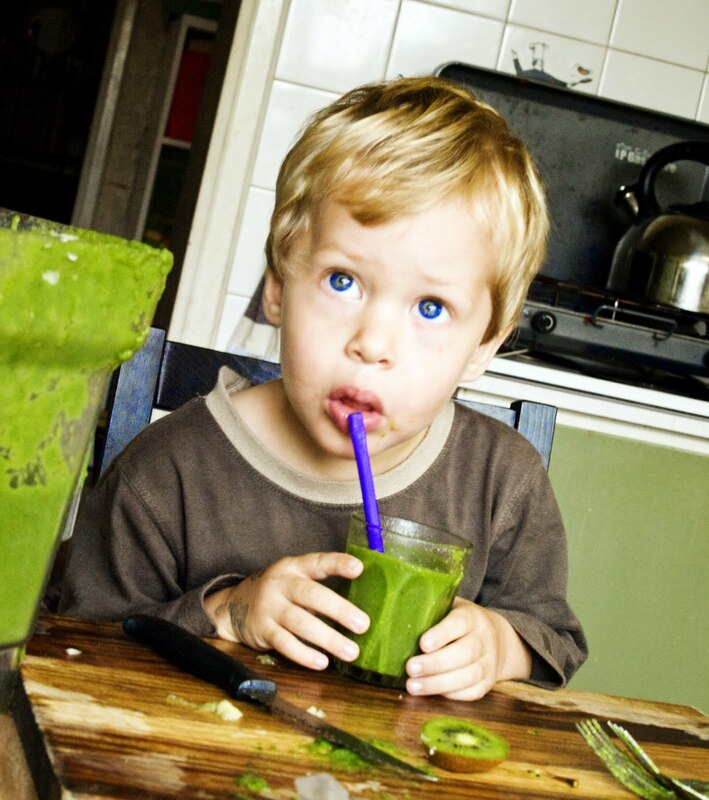 Try these recipes from Green Smoothie Revolution and experiment! Add ground chia seed to boost the protein.